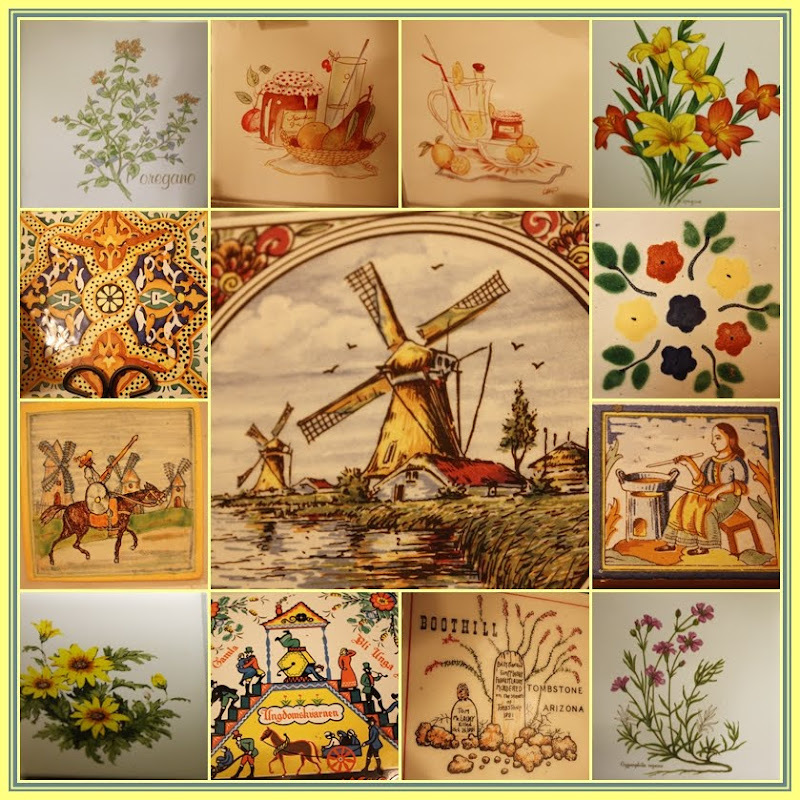 I'm linking to Mosaic Monday at Little Red House. You have now reached the Miscellanea part of this post. If you're just here for pictures, this would be the time to exit this blog. Thanks for coming. I have noticed that there are several blogs I visit on which my comments may not be getting posted. After I click "post comment", my computer jumps to the beginning of the post. I usually exit the blog at that time. Since I've been behind on my blog reading, there have recently been times when I wanted to look at a previous post. When I scroll down to click on "previous post", I find my comment for the post I just read still in the box with a "word verification" thingy that had not been visible when I was leaving the comment. Another problem I've had is that, occasionally, after I click "post comment" and have almost exited the blog, I see a message that my comment could not be posted and I need to try to post it again. It usually posts the second time I click on "post comment", but I think I've probably left some blogs without noticing that. I know that I have left comments that never appeared on some of these blogs. Is it something I am doing wrong? I'm wondering if bloggers are aware that they may not be getting all of the comments that are left for them. I love visiting blogs, but I'm usually hurrying. Maybe I just need to slow down and smell the roses (and make sure my comments are being posted). Do you always stay on the blog until you get notification that your comment has posted? Has anyone else experienced these problems? Any suggestions? I know -- I can make a mountain out of a molehill. I recently read a very interesting post and some very interesting comments on a blog. It was sort of an informal poll about what we like to see on blogs. I really enjoyed reading all of the comments. After I read the comments about what bloggers like to see, I started thinking about the multitude of blogs there are out there - blogs I've never visited, and blogs I never want to visit. I'm sure those bloggers have no desire to visit my blog either. (I still have trouble believing that anybody wants to visit my blog). That's the wonderful thing about blogging. We do not HAVE to visit a blog that doesn't interest us. So, if I visit your blog and leave a comment, I do not want you to feel that you have to come visit my blog. I want to visit blogs I enjoy reading, and that's what I want you to do too! Life is too short for me or you to be spending time reading a blog that does not interest us. Hi Laurie, you can always count on me to visit this blog. I love it! You have the best sense of humor and are so entertaining. I also so enjoy seeing all your collections and interests. So thank you for sharing with all of us. As for leaving a comment, I have the same problem you mention. I find that I have to wait for confirmation that my comment has posted, is saved, or is awaiting approval. I think it is a matter of not rushing. Don't know why some take longer than others. Thanks for your visits and comments. Both are appreciated. Love the mosaics in this post! Re comments...yes those spam blockers are notorious for slowing down the comment post time...and if you leave the url address before it "okays" the comment, at times they can be lost. There is so much variety...we cannot all like the same thing...and should never feel compelled out of any emotion, other than, we want to, as it relates to reading/visiting/commenting on blogs. I hear you! I have the same problem Laurie, and it really is annoying... I think I have left a post and then it starts to completely reload the page only to tell me that it didn't' work and I have to try again, OR to tell me that after reloading now I have type in word verification. ?? Why didn't the word verification show up when I was typing the post in the first place? If that continues to happen, I will probably just stop posting on those peoples blogs. I do want to visit people's blogs and I do enjoy making friends and leaving comments. But as much as I wish I had all day to sit around and blog, I don't. I have a full time job and a family. I wish people would take word verification off. They could always add "comment moderation" instead, so their readers weren't wasting time. boy, you sure opened a can of worms! Thanks for letting me vent. And BTW, I love all the pretty tiles! I have run into the same problems that you have encountered. I HATE word verification & have turned it off on my blog. If I get spam, I just delete it. Nobody reads it anyway & understands the creeps that post it are just trolls. I also seriously dislike music....mostly because I'm on the computer while DH is sleeping & I have to scramble to turn down my speakers when it suddenly comes on. Please put it at the bottom of the page, people, if you have to have it on your blog? 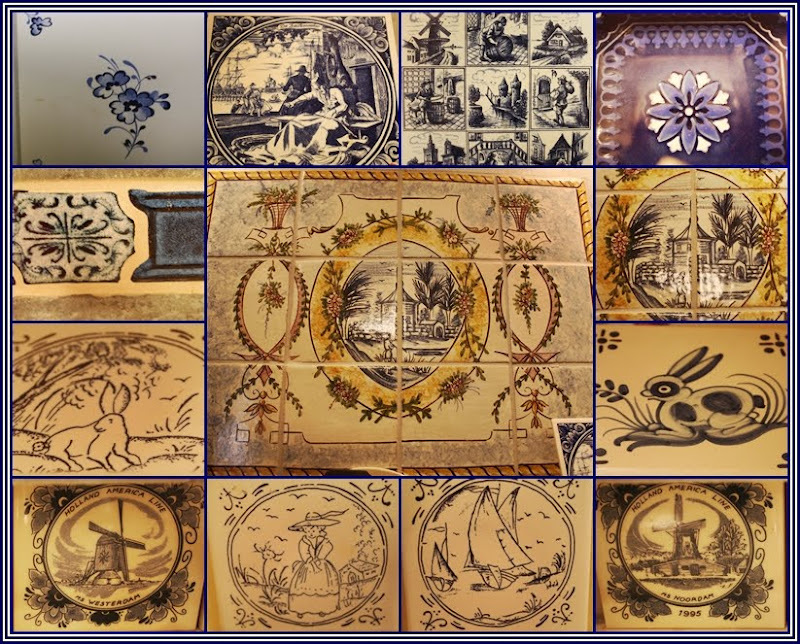 Your tile mosaics are lovely & I appreciate all your widely varied interests. Many I would not have seen if it were not for you & your photos! I'm here, I'm here! I love your attitude about other blogs and visitors. We all do have our own taste. I want my music on my blog...don't care what anyone says. Turn your speaker off. :) I'm defiant like that. First off let me say that I love your mosaic as usual. You always have interesting ones to me. Now let me say the "comment verifications" are a big pain in the patootie! I've often had the same problem and end up just not leaving a comment. Another thing that bugs the crap (excuse my language) is blogs with music and the player. If I wanted to listen to music I would have the stereo on. It also takes for....e...ver to load the player. I have the highest speed cable internet there is and it takes for...e...ver to load the player. I can only imagine how it is for some others. Ok, now I've got my b$itching out of the way today. Whew, I fell better! I also have had a problem with comments not posting. I click Post Comment, and it disappears out in blog land somewhere. I know what you mean about the comments...I have had that happen to me many times...so now I wait until it says posted or waiting moderation. I know some people must scan a post, because often the answer to their question is already in the post...but I don't think they caught it. I always TRY to tell myself that my blog is a journal for me and my family. I know at times I struggle with the comment thing....how some have hundreds and I get 10...but I then remind myself of the reason I do it. You can't get rid of me so easily Laurie....I love to visit the mosaic queen! I kick myself sometimes because so many trips to Mexico and no tiles!!! I've had some issues leaving comments on a few. It took me a while to realize Blogger added an extra step or two to leave a comment and then finally get it posted. Sheesh...how many clicks do they need. Some comments left on my blog go straight to my spam page. I usually retrieve the real comments but sometimes I miss them. Well, I for one want to visit you! I love seeing all your collections and how you put everything together. The tile mosaics are just beautiful. I'm having the same issues with leaving comments too. So I've learned to wait until I'm sure that my comment was actually published. The word verification thingy sometimes pops up when you think you're done. And having to hit publish comment twice is annoying. I hope it isn't happening on my blog. I've also noticed that comments are directly related to how interesting a post is to others. I may think a subject is interesting, but apparently it isn't always. So let's just keep blogging along and being creative in our own way. Some will like and some won't! How great to be able to visit you today, thank you for your prayers and well wishes. I always enjoy your mosaics, and anything you have written. About comments I usually try and stay until my comment is published,and if it doesn't i will retry. However there have been times when I just couldn't get it to publish and then i go on. However I enjoy blogging and love making new friends. I agree with everything you have written today and thank you for posting it. I sometimes think there is to much competition here in blogland. When I started blogging a very wise woman(my Mother) gave me some advice, she said" Blog as long as you enjoy it, and have fun, but when it becomes a chore and you don't enjoy it then that is when you leave." So far it is fun, now there have been days when I felt like I didn't have anything to say, so I don't. The tiles are great! So lovely, but what do you do with them?? As for the comment problem, we all get that sometimes, don't know why. From the volume of commenters here who expressed dislike for the word verifications and other delays, maybe folks should just slow down a little and do the process in the right order. Why is everyone in such a huge hurry all the time? It only takes another 10 seconds. 10 seconds is a small price to make sure your comment get posted. I love your blog and I look forward to seeing all of your lovely things. I don't think it is you. I too have the same issues and I just have to go very slow and WAIT! I'll be here, through thick and thin! I just read through all the comments. I've had the same issue with posting comments. I wonder what it's like at mine. I did disable anon. which made it unhandy for a couple of friends, but I am not so stressed about getting the bad ones deleted. I also like the moderation on, because I can click all and see the comments and if there is a meanie in the mix, I can delete quickly. I love those tiles. I regret not putting some sort of decorative tiles in our home. How's your ice/snow situation? Did you write and I miss it? I know what you mean -- some blogs we like and some we just don't... and, like you, I think that's just fine. Now YOUR BLOG -- Missy --- I ADORE! If you post it.....I'm gonna read it! Laurie let me first start out by saying I love your blog! I love visiting and reading. Now I admit I'm a "picture" girl and reading takes work because I naturally want to quickly absorb all the eye candy. I love comments so I try to leave them for others; therefore I will read so I have some understanding as to what I am talking about. Someone once left a comment for me and made reference to my "son" and if they had read the post they would have seen the mention of "my darling daughter". Embarassing moments. I have had the same problem when leaving comments as well. Therefore I took the word verification box off of mine. I understand you run the risk of spam but I have been lucky. However when I leave a comment, I go slow and wait for it to post and then see it with my own eyes. If it is pending blogger approval; well then I just move on. No need in stalking the blog. I will be back and always happy to see you! 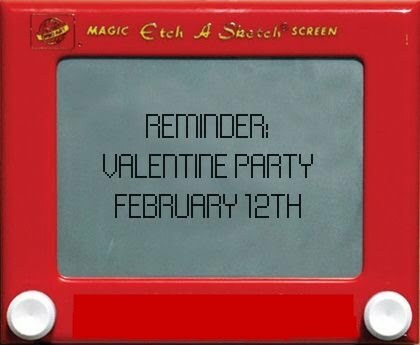 Laurie, the valentine's party sounds like a lot of fun, count me in. I will have to figure out what to post though.. have a great week. Laurie, I have the same problem with comments as you and I am sure that some of mine never post either. It is really confusing all the different ways there are to leaving comments. Kind of like those charge machines at the stores. They are all so different and I really need my glasses to read all the instructions. I know what you mean. There are some blogs like that where you leave a comment and it goes to the top and then I've started to wonder whether my comment made it or not. Most of the time in that case it hasn't. I click to send it again and then I have to do the word verification and then it will go through. I know too that I've not been able to leave comments before when I didn't realize this was happening. It is a real pain having that happen. I don't know whether it ever happens when someone tries to leave a message on my blog or not. I'll have to read the comments left for you for suggestions and thoughts on this. I really enjoy coming over to read your blog....I also know we can't get everywhere we want to all the time. OMG, it is!! No clue what is wrong!! I love both of your mosaics! They are such pretty pictures. I general wait until my comment is either published or states that it is waiting for blog owners approval. I have gone through what you are referring to a lot so, to save some headache on my part, I hang around to make sure everything went through. Hi Laurie! What beautiful tiles. I really enjoyed your post. I'm with you....who cares about the quantity of comments/visitors, it's the quality! Thanks for popping by! Your not getting rid of me that quickly, I love your blog and you Laurie and I can't stop laughing. Your such a silly thing, and I'm sure you get WAY MORE than 5 visitors a post. You are such an amazing blogger and even if I don't visit you every day, you will always stay on my favourite list til the day I die. Which brings to something that I have been thinking about, What if I die and my blog just stops and no one knows ? Maybe I will have to leave instructions in my will to get someone to tell you all. Gosh all those things on the internet I've joined with all those passwords, I better have a address book attached to my will. I'm off to cook dinner and have a glass of wine. Oh those tiles are so grand. I will join in on the Valentine fun on the 12th. I have occasionally had problems with leaving comments, so now I usually stick around till I've seen that it has "taken." Sometimes, a word verification will pop up with the bottom missing -- I can see the word but there is no space to type it in. Has that happened to you? BTW, I think you have got the whole blogging thing right -- blogging without obligation sounds like a good idea to me. :) That said, I always enjoy my visits here!!! I love the tiles too, but I'll join in on the comment discussion. I know everyone said how much they hate word verification but if your not using it your taking a big chance. My first blog was on wordpress & I didn't enable the word verification. It was a lot more than spam that got on my site. It was some weird virus or something, maybe spam. But so bad that I had to shut the whole thing down & start a new blog. No fun. So I hope you will tolerate my the gatekeeper at my comment page because I love reading your comments. And BTW, LOVE your blog too! Dear Laurie-As I always say "You can't hurt my feelings--I have children"! I don't think anyone visits you out of obligation! It is odd though. Some blogs are just like dropping in at an old friend's house and others are not a good fit. There is surely something for everyone out there! I love all your tiles ..and the mosaic you made! I have the same problem with word verification ..it take three tries sometimes but I just try to be patient. It may mean I visit Mosaic Monday on a Thursday night as I am a slow typist and my eyes are not what they use to be, and all the extra typing slows me down even more...lol...but I do try to visit everyone that comments on my blog. I know we can't please everyone ....different strokes for different folks...but I do enjoy my visits to your blog! I wish I could join in on your Valentine party but since I don't have children at home anymore and my one grandchild lives far away, I don't decorate for the holiday. If I think of something else to do maybe I'll join in last minute. I bet it will be fun and I'll be sure to visit many participating blogs.\Thanks!